Litvinne was born Françoise-Jeanne Schutz in St Petersburg in 1860. Her father was Russian, her mother French-Canadian and at the age of fifteen the girl went to Paris to study, eventually taking lessons from the famed Pauline Viardot-Garcia. She made her debut in 1883 and travelled to Brussels, the Paris Opera and back to St Petersburg and Moscow and was invited to La Scala in 1890. A little hiatus after her marriage saw her leave the stage but she soon returned giving Parisian premieres of Wagner (Isolde, Brünnhilde in Götterdämmerung in 1899 and 1902 respectively). And it was as Isolde that she made her Covent Garden premiere, later singing Aida, Gioconda and Donna Anna. Though she was renowned as a Wagnerian she did a lot of work in other repertoire, from Gluck to Saint-Saëns, until her operatic retirement in 1917, though she continued to sing in recitals until 1924. Thenceforth she became as notable a teacher as she had been singer, counting Koshetz and Lubin amongst her pupils � as a delightful pendant both make a little appearance at the end of this disc. We have here a number of items made for Fonotipia and the Gramophone Company. Malibran doesn�t date them but the earliest derive from sessions made in 1902 and they are notoriously hard to come by; in one discography from the early 1970s the existence of one of these discs is wistfully hoped for but not expected. Here it is � here they are in fact. It�s no use pretending that you will find many an easy listen because you won�t. Deficient original recordings and pressings, damage, and distortion afflict a number of them and a veil of surface noise has been left intact. But I ought to stress that these are no ordinary documents � my reviewing colleagues on this site, God love them, who vomit at the sound of light crackle on a 1946 Decca had better head for the hills now. What sort of voice did Litvinne have? Hers was a strong dramatic soprano, of course, with a big range and well suited to Wagner. It had a powerful centre but a more strained top and embodied a certain contralto depth. It�s not an especially beautiful voice � but then neither does it curdle � and is forcefully projected even in the 1902/03 sessions with a fine technique. It was I suppose a cosmopolitan French sound and less explicitly Gallic than others. Her Massenet though is noble and loftily phrased with that mezzo power to the fore. The Aida is tough listening with one of those banjo-sounding plinking piano accompaniments. Her singing is plain but attractive and my only concern centres on the transfer. She sounds fractionally more soprano sounding than we know from other sessions � is the transfer too fast? Her Schumann Ich groll nicht is not for everyone. It�s a frankly operatic voice barely scaled at all in this lied. Nor can the recording cope � there�s some unmerciful blasting � but against the sheer inappropriateness of a voice this big taking on a song of this kind we can still listen to her thrilling chest voice. An exciting, exaggerated, utterly "wrong" performance � but insightful into her way of doing things on the recital platform. I say Ich grolle nicht but as with other performances she re-recorded a lot of her repertoire and there are two recordings of it here. The earliest sessions were made with none less than Alfred Cortot and the later ones with an unidentified pianist (unidentified by me at any rate). We can test her technique in the coloratura demands of Meyerbeer � full of trills, registral leaps, and divisions � all fine. She has some dicey moments up top in Verdi in a brace of performances that don�t really show her at her best and her Samson reveals something that contemporary critics didn�t seem to comment on � a certain shortage of breath deriving from insufficient breath control. 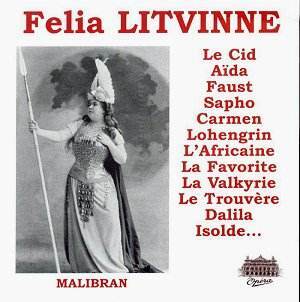 Her Carmen is slightly untidily phrased but the Gramophone Le Cid (Cortot�s recordings were always with them not Fonotipia) reveals much the same qualities as her Fonotipia, though in worse sound with that wobbly piano sound preserved intact. Her Ho jo to ho is dramatic and fiery if scrunchy at the top of her range � but one can certainly see why she was so admired in Wagner � and we get a surprise in Ich grolle nicht, the second version. This was actually from her 1902/03 sessions and therefore predated the 1905 one I mentioned earlier. The Cortot accompanied one is much better � phrasing is much more appropriate, she is more measured and less operatically insistent; the voice is better reined in. It�s hardly a lieder voice but it shows how changeable interpretation can be. To cap it all the 1902 disc is in better shape than the 1905. She was actually a pioneer of mélodie on disc. Her Hahn is not here but her Fauré is � a big voiced and rather no-prisoners Les Berceaux (the early disc of it with Cortot suffers from a rough copy). Her Isolde is rather compromised by the recording and some technical limitations in the voice but her Gounod Sapho is very accomplished indeed. Litvinne made about forty sides and one private cylinder. Here we have twenty-four of them in obviously variable states of preservation. The inherent problems shouldn�t be minimised but neither should the value of this disc in preserving the voice of a singer of significance in late nineteenth and early twentieth century music making. You will spend your life trying � and failing � to find all her 78s so enthusiasts should start here. It would have been appropriate to have some documentation about textual, vocal and discographical matters but we get a simple paragraph on her biographically. Never mind � the music�s the thing. For all the inherent problems I must say I found her fascinating.